After two decades of flawless execution, a mistake is made. The Testament Killer leaves behind DNA evidence in a mask. Knowing it is the end, the Testament Killer livestreams a suicide just as a news story breaks with his identity. Upon recognizing the name TTK as one of your neighbors, you and your friends decide to break into his home to try to find the money he took from his victims before the police arrive. But be careful… True evil never dies. IS THIS ROOM KID FRIENDLY? No. This room has serious horror and violent themes. It is recommended that nobody under the age of 18 participates. It depends on what you find scary. This room is designed for the Halloween season crowd, so there are some horror elements. Some may find them scary, some may not. But we hope you enjoy your experience either way. This room is great for escape artists of every experience level. What type of Escape Room is this? 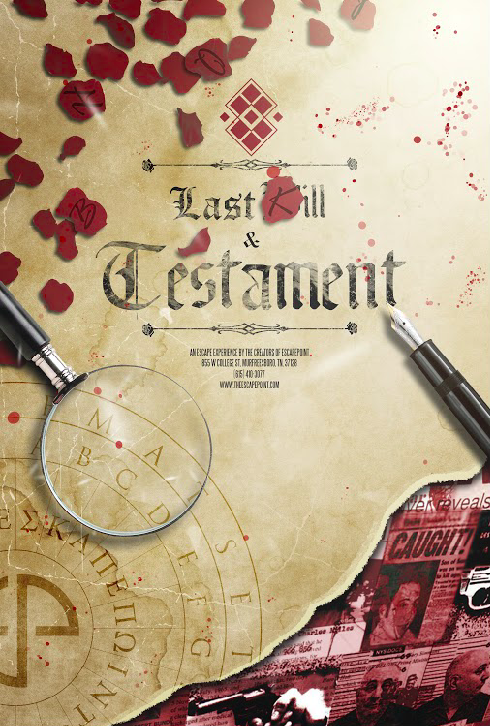 Last Kill & Testament is designed to be a mix of non-linear and linear room. It’s appropriate for small and large groups alike. What's the capacity for The White Room? We recommend 6 players, though we are willing to squeeze a couple extra if you really want to play with your friends.